A unique way to see the pearls of Italy are the Italy Tours. Art, culture, traditions and the secrets of the most beautiful cities will be the stars of your holidays Italian, in all periods of the year. 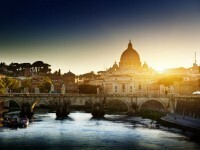 Rome in the autumn told in ten photographs that reveal the Eternal City with a new, romantic and sparkling. Rome invaded by Street Art. Discover the best murals in the city of Rome, who becomes the canvas favorite of these new artists that color this beautiful city. A visit to the Vatican Museums, Sistine Chapel and St Peter's Basilica, Visiting the Vatican Museums is an unforgettable experience that requires strength, stamina and patience.